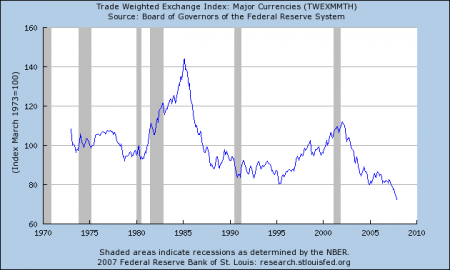 Will currency depreciation solve the trade deficit problem? March 19, 2010 / 35 Comments on Will currency depreciation solve the trade deficit problem? The answer is plainly no. A depreciation of the US dollar will not remove the trade deficits. 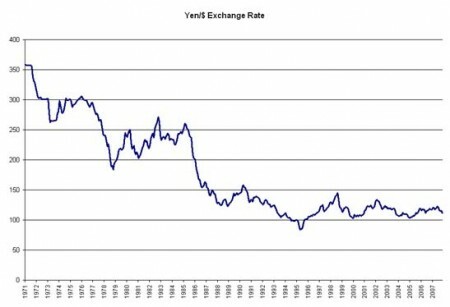 In 1970s, one dollar exchanged for 360 Japanese Yen. Now, one dollar is worth for only around 100 Yen. 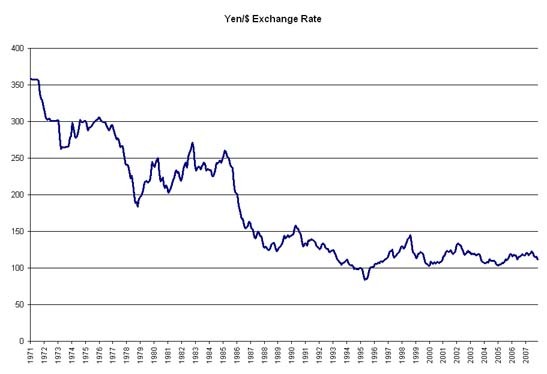 In other words, Yen has appreciated 72%. Still, Japan runs a huge trade surplus with the US today. Exchange rate is just one of the many factors that drive the trade balance between two countries. Differences in interest rate, savings, growth rate, level of financial development (in terms of how easy to get access to consumer credit) all played a role. Here I show a historical graph from St. Louis Fed, which looks at the relationship between trade-weighted dollar index (with major trading partners) and the US trade deficits. 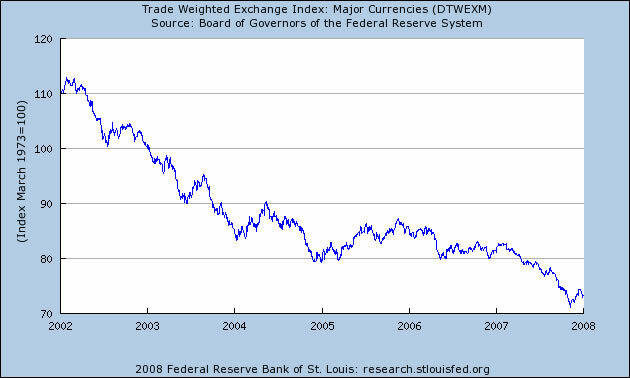 The green line is the dollar index (left axis), the higher the value, the more valuable the dollar. The red line is US trade deficits (right axis) in billions of dollars. 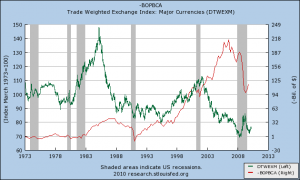 As shown in the graph, from mid 1980s to early 1990s, the dollar index dropped (or depreciation) against major currencies by over 40%, dropping from 150 to 85, and the trade deficits got eliminated. During recent years, especially after 2002, the US dollar index declined from 110 to 70 (in 2008), another nearly 40% drop, however, the trade deficits soared. So there gotta be some other reasons that drive the trade balances. How about the super easy monetary policy by the Greenspan Fed? The extended period of low interest rate after 9.11 helped fuel the housing bubble, creating a fake appreciation of household wealth…American consumers became more confident than ever, resulting in surge of consumption, and imports. My conclusion is: currency is certainly a factor in determining trade balances, but it’s not all that matters. So don’t be fooled. Finally, I wanted to entertain you with another piece of debate on the issue.